$1,170,000 Only $16 per meter! ALSO AVAILABLE AS TWO PIECES: 6.18 Hectares for $989,000 and 1.40 Hectares for $198,000. 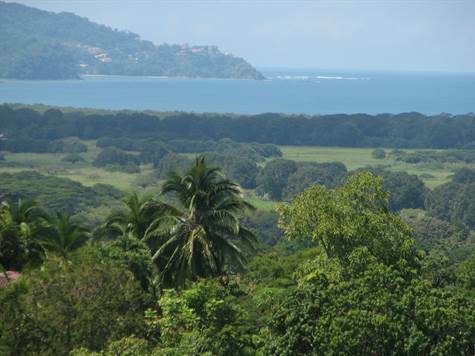 ROLLING USEABLE VIEW PROPERTY with multiple building sites, boasting breathtaking vistas including the Gulf of Nicoya, Tarcoles River Valley and Carara National Park. Bordered by two nationally protected wildlife migration corridors, this property offers wildlife viewing of many species, at its best. Most notably the famous wild Scarlet Macaws of Carara are frequent visitors on their daily sojourns; nesting in the Guacalillo Mangrove Reserve and feeding in the Tarcoles River Valley and Carara National Park. More than 20 exotic varieties of fruit trees plus decorative flowering plants have been lovingly nurtured by green thumb owner. Friendly International Community of property owners have coordinated for years in improvement and maintenance projects resulting in an exceptional neighborhood where pride of ownership is evident . All night security at entry provides security and peace of mind 7 nights a week. Twenty minutes to the growing city of Orotina. Thirty minutes to Heradura and world class golf and fishing. Forty five minutes to beaches of Jaco. One hour to San Jose, CIMA Hospital, Airport. Local services only minutes away: gas, restaurants, mini markets. HERE YOU WILL FIND PEACE AND PRIVACY IN A VERY CENTRAL LOCATION. Very few properties remain available in this best kept secret of a neighborhood. NO OTHER PROPERTIES IN THE AREA COMPARE TO THIS ONE. WHATEVER YOU CAN DREAM, YOU CAN BUILD IT HERE!